Nothing much to report about. Conditions are very pleasant. Sunny skies, gentle breezes, comfortable temperatures! Just a great place to be, need I say more? 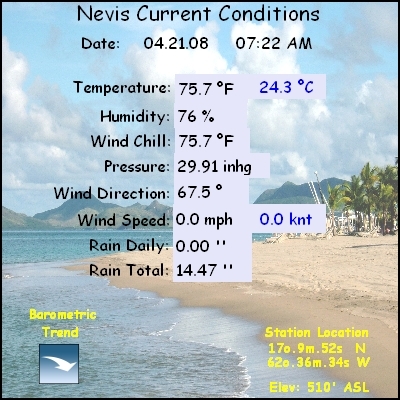 Nevis current conditions. A great day for sailing!! After another bout of windy, sea churning few days things have settles down. Sea Bridge Ferry can now do the crossing to SKB without having it's deck washed clean by rough seas. Looks to be a few pleasant days ahead. Temps still quite comfortable. Sorry grabbed the old pdf file. Correct one attached. Strange weather happening about the Caribbean. Seems most islands are reporting the same sea conditions. Some impressive photo's submitted of crashing on shore waves. March started as a dry month and it looked like it would continue for a bit but ended as quickly as it started ending up as a 'normal' month in the rainfall dept. Attached year to date weather summary for those interested. Waves slamming into the cliffs below at almost the same intensity as two weeks ago. Quite curious to have two rare events so close to each other. Supposed to pick up some more tomorrow! Keep an eye on your forecasts! Since my sailing buddy Harry doesn't post often, I thought I would pick up some slack. Seas are up in what folks are calling a once-in-a-lifetime event outside of hurricane season. A friend who has been here for 20 years surfed for the first time ever at Oualie Beach. The dock there has lost all of its decking. In Tamarind Bay, one fishing boat sank, a lobster boat was torn from its mooring and this morning was bouncing amongst the rocks on shore. The car ferry left early Wed morning and has been hiding in Majors Bay over on St Kitts since. Several beach bars are closed, and we fear we may lose more than one of them. We live 35 feet from and 35 feet above the sea, and we're getting wet on the deck from the waves crashing into the cliff below. Quite a time. I understand it is tougher elsewhere, and caribwx.com and windguru.com predict we're in for more of the same through Sat nite. The easter swim from Nevis to St Kitts is scheduled for Sun morning at 9am - we hope it all clears out by then, and we can survive until then with little more damage! Things have become very dry with a strong sun & little cloud cover. Temperatures are still comfortable & humidity isn't bad. Since 5-Mar I've recorded less then 1/4" of rain with no rain fall in last 7 days. Looks like this dry pattern will continue into the unforeseeable future. Sorry about being late on posting the 2007 Weather statistics but I finally got around to getting it done. Also have the Jan 2008 Data attached as two separate files. The cool weather continues, although the winds were out of the SW past two days and the days did indeed seem warmer. That changed yesterday when they shifted around to the NE again and brought back the cool temp. Photo attached to show everyone just how drastic a change it's been. Can hardly believe the difference. One good thing warm weather is coming!!! Will reveal where at next posting. Nothing much to report. Normal January weather. Some sun, some rain, windy then not windy. Still a bit on the cool side. Sea temp's warmer then swimming pool water by about 4 degrees. Doesn't look like a "beach day" today. Lots of low gray clouds about. Bring your umbrella with you today. Satellite says they will be with us most of the day. January is shaping up as another wet month, perhaps I should say "above normal" rainfall. Just about time to say good bye to "Old Year" & bring in the "New Year"
Weather has been flawless with nice breezes, bright sunny skies. Was outside last evening looking at the stars. It was a perfect evening for studying the heavens. Deep black sky, crystal clear without much cloud cover. Saw two satellites pass overhead while enjoying the view heaven ward. Had quite a stormy night last evening with over 1" of rain from the storm, throw is some lightening, add some thunder & of course Nevis Electric turns off the grid. Do all islands do that? December rain fall is at 3.50". 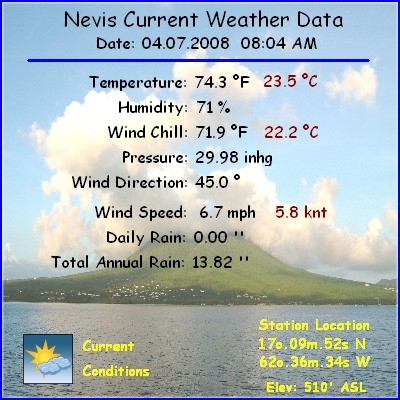 If that continues Nevis will top 60" annual rain. Starting to compile annual rain fall over the past several years to see how 2007 compares. 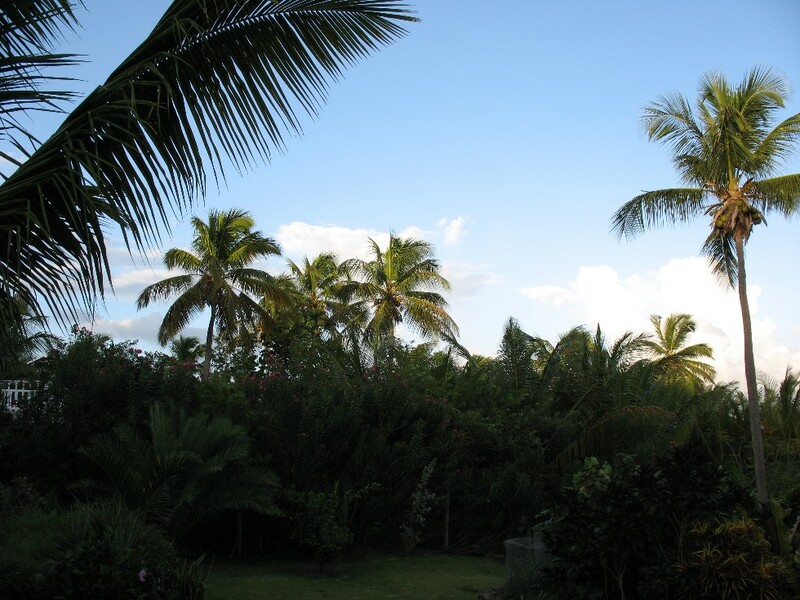 Seems like Nevis is back on track with "normal" weather. Normal being tropical showers every so often. Party cloudy skies. Temps normal for this time of year. Humidity reads 81% but doesn't seem so, maybe because I'm inside writing this and not outside doing some chore where I would feel it? Ocean swells hitting the lee side of Nevis for several days now creating murky waters along the beaches. Other then that all is well at this latitude. Current weather station data attached. November has indeed been a month of little rain. Received just enough to keep things green. Days are in the low 80's & night time is terrific sleeping weather with lows into the mid 70's. Attached the weather summary for year to date for those interested in such stuff. Looks like November is shaping up to be the least amount of rain for year 2007 unless December is drier. Only 0.61" to date. Temperatures in low 80's day time & mid 70's evening time. Cool with a breeze out of the NE the wind chill is down into the high 60's. Now that's COLD! Sorry about the length between reports. Not really much to talk about. Exception might be the lack of any meaningful rain on Nevis in the past three weeks. Weather is delightful with the cool Christmas winds starting to blow & low humidity.Nights are comfortable with temps. in the mid to upper 70's. For those expecting nice sunny beach weather I think you'll be disappointed. 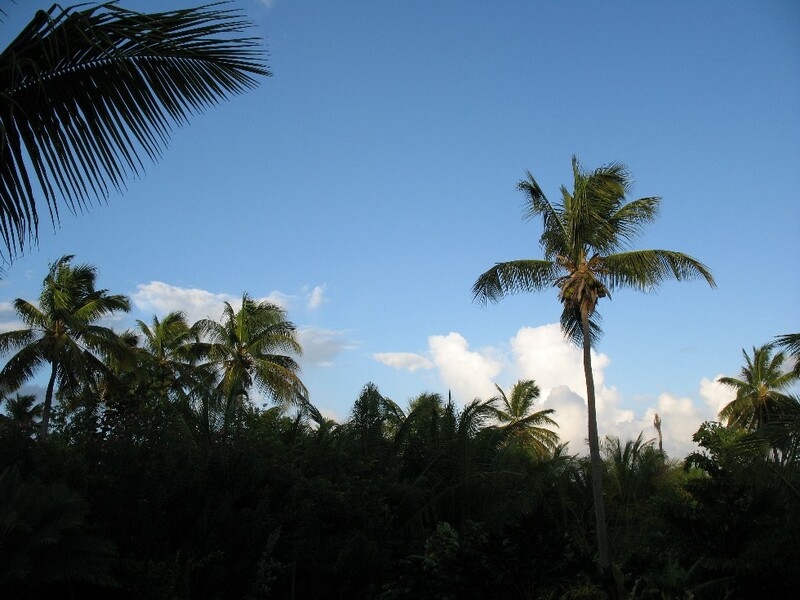 There are high top clouds all over the Caribbean chain of islands. More like book reading time then beach time. It just doesn't look like clearing will take place any time soon. Not a wash out but not bright blue skies either. After a very wet start yesterday the rain stopped & some blue appeared. Blue being blue sky with some sun. Weather Station reports 1.77" from yesterdays rains. Cistern full (again) & pool overflowing. Today looks to be a sunny day with possible showers at any time. After those big rains of two weeks ago not much has fallen since then. Gardens are starting to look a bit parched. Looking at satellite images you would think "tomorrow will bring lots of rain" but next day the images from space have totally changed. A cat & mouse game. Weather has changed to that fall feeling with dry winds and very comfortable temperatures. After the hot days of Jul-Aug-Sep this is a welcome time of year. Glad yesterday of over & done. Weather Station collected 2.85 inches of rain in a 6 hr time frame. Out of those 6 hours most fell at two different times of 1/2 hr each time. From reports around other parts if Nevis it sounds like 5-7 inches fell at some locations. Lots of rutted side roads. Those gully's are now ghauts. Looks like today will be a clean up/repair day for the roads crews. Outside it appears to be a possibly sunny day???? Things don't look encouraging with another wave 750mi to the East with lots of high cold tops. Lots of boomers & clashes this early am. Woke me out of a sound sleep (very hard to do). Dog was huddled under chair (very brave she is). Cats where all eyes & ears. Almost 1.75" of rain in 1 hr with this storm. Attached weather station date for those interested. All is quiet now but satellite maps show we're in the "orange red" of it. 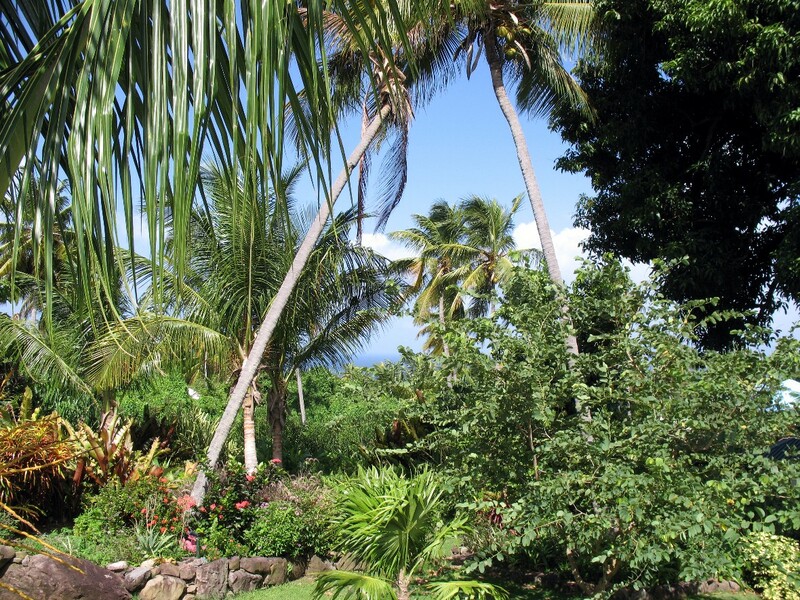 Finally the sun has returned to Nevis. After several days of gloomy, dreary, rainy weather the sun has returned. I hear lots of lawnmowers out there working this morning. Taking down the hay fields!! Mine included. Weather data & a photo showing the day with sun, taken just 10 minutes ago. The sky opened up for 1.5 hrs between 4:30 pm & 6:00 pm with 2.75" on the roof. Can't verify everyone and everywhere got that much rain but it did indeed come down in a big way. Roar was so load at times couldn't hear the TV at max. volume. All is quiet & calm now as I write this. Another great day in store for Nevis. A bit on the warm side yesterday & today will be the same. Only noticeable if you do manual work. Great weather to hang out with a book on the beach or veranda. 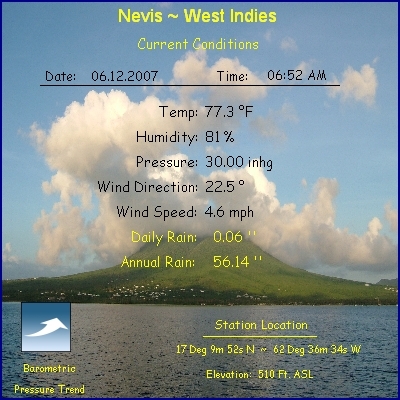 Another terrific day in store on Nevis, that said, looking to the blob east of us I'd say in 12 hours we will be in the rain maker. It's moving rather slowly so might be an all night thing?? Been having a couple of cloudy rainy days but things are clearing up. Today looks to be a sunny one. Not much else to report in the weather dept. 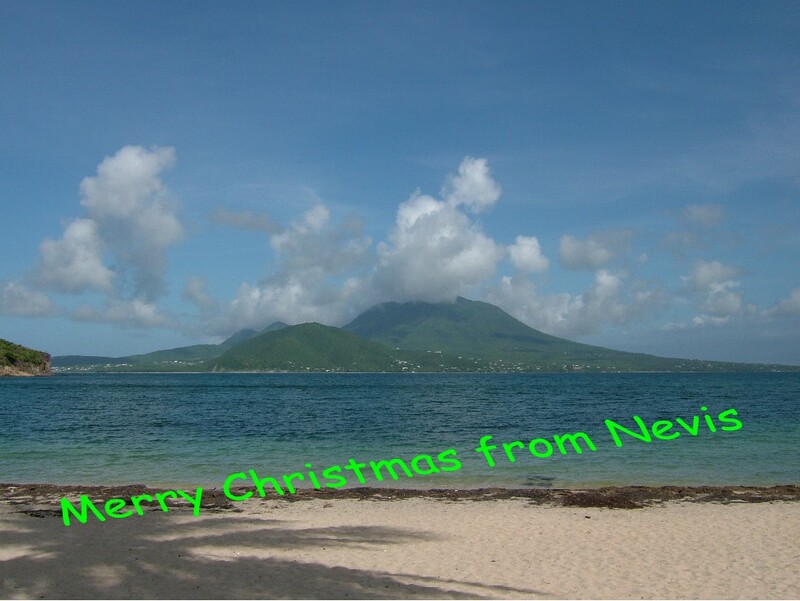 All has returned to normal on Nevis. Sunny skies with gentle winds. Last evening was totally calm with "0" winds. Total rainfall from Dean was 0.89"
Latest weather station data attached. Gusty winds blowing BUT no rain to date from Dean. Looks like Dean passed over the south end of Martinique which puts the center approx 210 mi from Nevis. Cisterns may not be overflowing from Dean. It looks as though Dean will pass between Dominica & Martinique with winds somewhere around 100 MPH. That puts the center of Dean about 172 mi from Nevis. Based on NOAA data we probably won't see strong winds. My best guess would be 40-50 MPH. Will know by day light just what Nevis is feeling for winds gusts. Barometric Pressure is at 29.95 and seems to be holding at that number. Ok here is my assessment of things based on NOAA projections as of 2pm today. Storm force winds extend outward from center 70-90 mi (that means Nevis will receive sustained winds below 75 MPH) but gusts could reach 75 mph, or above, as storm strengthens. A rather fast moving system, so as soon as it starts it ends, well thats what we all hope for. Today just can't get any better. Almost like a summer day in northern Vermont. Lo humidity, Temp at 85 def F.
All eyes are looking East at Dean. Attached the 5 Day track prediction from NOAA. Looks like it will track south of Nevis. How much??? Can't tell, wouldn't guess. Thursday pm or Friday am will have a good bead on exactly where.Winds right now at 40mph. Not much to report in the weather dept. Things are calm with those occasional tropical showers. Temps. not overly hot. Breezes gentle (except when crossing the "Narrows" in a Trimaran). Weather has settled down, after several days of nice breezes. Satellite images don't show much of anything happening around the Leeward Islands. Low clouds about but that's normal for Nevis living on the lee side of Nevis Peak. Attached the latest summary of data from weather station for those interested. Great weather the last 2-3 days. Not to hot, nice breezes, blue skies all around. Looking at satellite images there is a depression south of the Leewards & it appears to be moving in a north westerly direction. If it continues on present course it could be swept over us with the low level winds. No advisories are posted as of this time but it looks like it will be Advisory #4 if & when. Early morning photo's from pool deck & current conditions from weather station. - What More Rain ??? 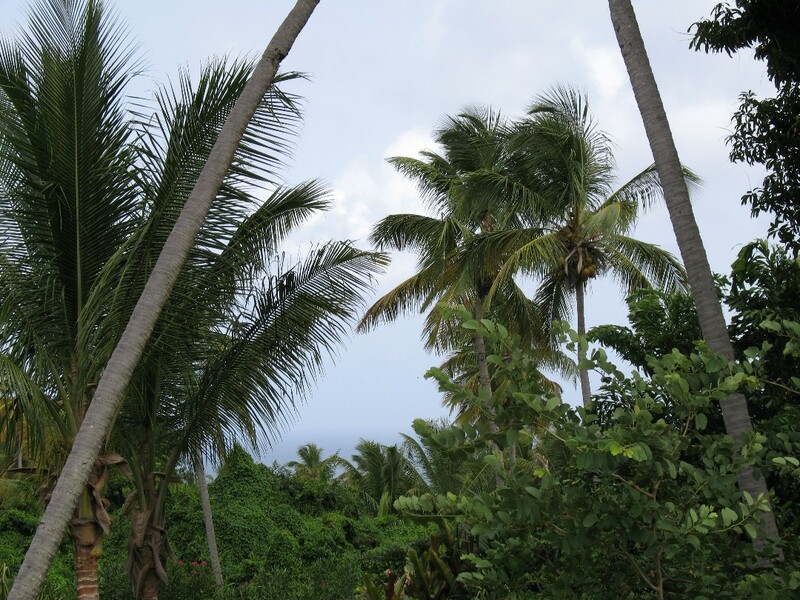 Yet another doomy, gloomy day on Nevis, maybe not? The satellite images say it should be sunny but out the window I see low clouds with peeks of sun. Seems like this pattern just won't go away. Then again we are in the rainy season. All is not a complete washout but for visitors here they probably want blue sky with lots of sun....sorry. 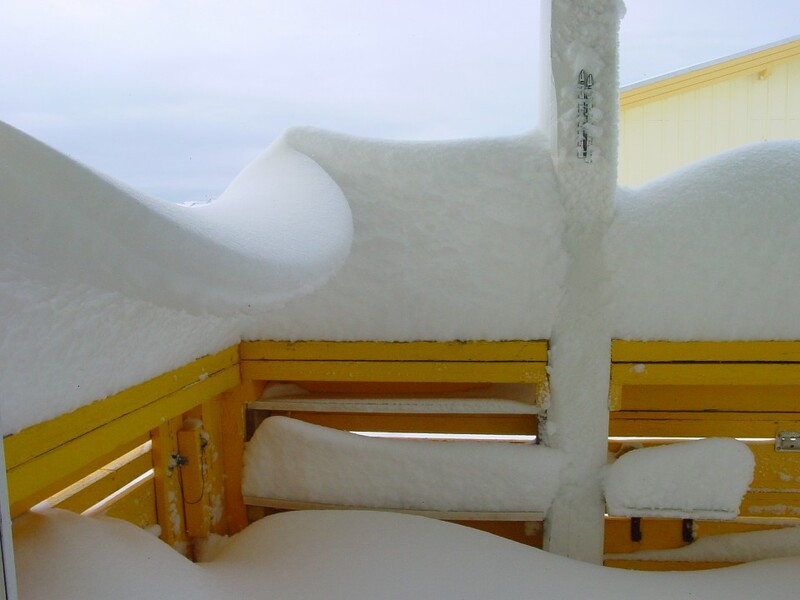 Some photo's to give you an idea of the weather we've been subject to of late along with weather station data. Weather just isn't much to brag about ! Lots of clouds with periods of showers, this has been the trend for several days now. Satellite images show this pattern to continue. The positive side....things are quiet in the tropical storm department. Looks like on & off showers will be around for the next few hours but after that things look quite good for blue skies. Had some nice breezes the past 24-36 hrs, felt like Jan-Feb weather. I see no threat from the tropical wave on the maps. - OK one more try ???? June turned out to be a rather wet month with over 6" of rain. Seems like every day we were getting a downpour. Certainly no worry about lack of water. Temperatures haven't been unbearable so that's a good thing. Attached the year end data for those interested in stuff like that. Looks like today is setting up for a picture perfect day. Nice refreshing breeze & not to humid. Good day to lime at the beach. We are behind the normal rain fall figures for the year. I'm sure that will change when those waves off Africa start moving across the Atlantic. Hopefully they will remain as just "waves" with rain only please. Else all is well here in paradise. Weather feels like January weather. A cool front moved through two days ago bring clear skies.......right to the horizon. Unlike the hot hazy stuff we've had of late. Nice breezes, comfortable humidity, wonder how long this will last? Today appears to be a repeat. Getting to usual brief shower almost every night. Was at Herbert's Beach for a day picnic and couldn't help but notice how green the east end of St. Kitts was looking. None of that burned, parched look. Warm & very hazy these days. Topped out at almost 92 deg F end of May. Getting nice showers every 2-3 days to keep things green. Attached year to date weather data summary from weather station. FYI: I'm using a Lacross Technologies Model 2310 Wireless Station. Connected to the PC Serial port to download captured data. Then imported text file into MS Excel. Maxed out with a temp of 91.9 deg F two days ago....in the shade!!! Days are hot!!! Did get a nice shower yesterday with .12 " of rain from the short burst. Will post year to date data in next few days. Since last post we have had some showers although very isolated. Seems most of the rain fell on the western side of the mountain in the area of St. Thomas Parish. A few drops in Jones, 1/4" in Jessups, a few drops in Charlestown. Today looks clear & with a bright blue sky. Sorry about the lack of reports in the several days. Most winter visitors have left & the streets of Charlestown have reverted to the summer crowd look. Weather wise......total rainfall since 5-May-07 has been a measly .04 inches. Barely enough to feel the drops. Once again gardens are starting to "brown up". Swimming pool levels are dropping due to evaporation. Breezes have been light, just enough to make it feel comfortable. Did a 4 day sail to Anguilla for race week, will have a couple of photo's next posting. Need to reduce size of photo's for posting to internet. 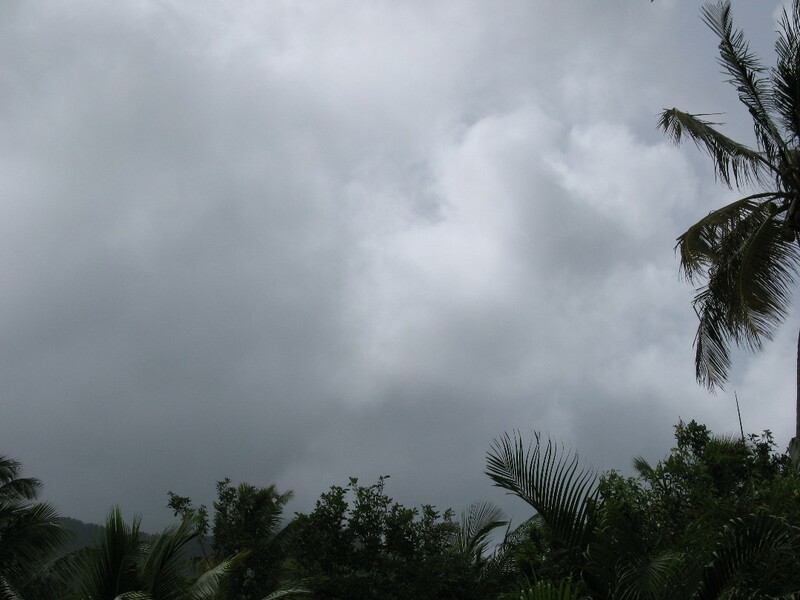 All in all thats the weather here on Nevis.